I will never give or sell your email to anyone. My newsletter comes out every two weeks and contains success stories from our readers, plus other career hints and relationship tips. Parents have the best chance to be good parents when they understand, accept, and appreciate their kids as individuals with different needs. But they cannot give their kids what they need if they don't know what their needs are. Kids want to be loved for who they are and not who their parents want them to be. By understanding the uniqueness in their kids, parents will know how each one needs to be nurtured. 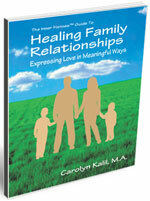 This book will guide parents in creating harmonious relationships with their children.